Bonang Matheba’s cousin Pinky Girl recently revealed her intentions to one day become a star in her own right. Up until a few months ago, hardly anyone knew who Pinky Girl was. But the shy girl from Pretoria stole the hearts of thousands when she made an appearance on her cousin’s reality show, Being Bonang. Pinky Girl now has her own groupies, and is ready to be a star. “I am not a celebrity, at least not yet but I am working on it,” she told Tshisa Live recently. She says she is no rush to become famous, but we think we’ll be hearing a lot more about this rising star in future. Here are five things you need to know about Pinky Girl. Pinky Girl could easily be mistaken for a fashion blogger, but she has actually never worked in the fashion industry. She focused more on her brains than her beauty’ she studied Computer Sciences after high school and has worked in the IT industry for six years. Pinky Girl is an only child, but describes her cousin Bonang as her sister. The pair were very close growing up. “I found a sister in her, almost like a twin. So we grew up together, I was in Pretoria and she was in Joburg but her father would come get us for school holidays and we would go to Mafikeng (now Mahikeng) where he was based. Those were amazing times with great memories and that’s how we got close,” she told Tshisa Live in an interview. Pinky Girl has been living in her cousin’s shadow for years, but she is far from jealous of her fame. In fact, Pinky Girl is one of Bonang’s biggest fans. “Proud of my girl B”, she captioned a picture of Bonang’s Destiny magazine cover. Pinky also has no desire to steal Queen B’s shine. Until Being Bonang hit our screens, hardly anyone knew the two were related. 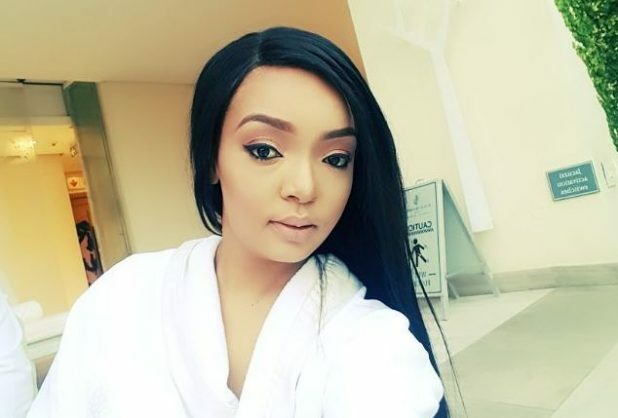 She has described herself as a shy person, but Pinky is ready to step into the limelight, and we are pretty sure Bonang will be one of her biggest supporters. Like her famous cousin, Pinky Girl enjoys the finer things in life. She regularly wears designer clothes, and has accompanied Queen B to Paris and other international destinations. Of course, both the women love champagne! One of their popular phrases on Being Bonang was “champagne, darling”. We know her as Pinky Girl, but her family call her Tebogo. Pinky says that her granny is responsible for her quirky nickname. “The name came from my grandmother. Apparently when I was small I was so light that my grandmother would say: ‘okay this is our pinky girl!’ Then it stuck, everyone calls me Pinky Girl, even the smaller kids at home call me Pinky Girl now,” she told Tshia Live in an interview.